James Bond is getting older. His shot is not as on point as it once was; his stride not as fast as in his younger years. In fact, it saddens me to say that his stomach is not quite the washboard it used to be either. There is one notable offshoot to Bond’s decline in prowess though. With age, comes wisdom and with SKYFALL, the 23rd film in the 007 spy series, that wisdom lends its weight to what is without question one of the most exciting and emotionally charged adventures the series has ever seen. Sam Mendes, the Academy Award winning director of AMERICAN BEAUTY, opens his crack at the Bond series with the man himself, once again embodied by the masterful Daniel Craig, blurred in the background. As he comes into the light and into focus, we direct our attention to his eyes. These are the eyes of a determined man and before either he or we are able to blink, he finds himself in a high-speed bike chase that takes him to the rooftops of Istanbul, overlooking the Grand Bazaar. Why waste time really? This is an action film after all and Mendes has a clear and firm understanding of what the audience wants from their favorite international spy. Bond has grown into a complex character over the years. In his last outing, QUANTUM OF SOLACE, his complexities got the best of him. Bond was melancholy and the film suffered for it. In SKYFALL he is no less tortuous but Mendes handles the character with much more control and allows the film’s intricate and energetic action sequences to drive the film forward. Without the weight of Bond’s suffering to hold the film back, he commands even more attention and emerges with even greater strength as a result. This is all the more impressive considering what he has to endure at the onset of the film. Before the first chase is through, Bond is lost and presumed dead. Naturally, the audience knows he isn’t dead, as this would make for an awfully short film. What he goes through should have surely killed him but somehow he is reborn, resurrected even, and all that once haunted him now seems to propel him forward with a more profound momentum than he has had for some time. It is never explained how Bond survives, although I suspect it has something to do with the healing power of Adele’s opening credits theme song, but the fact that he does live on, confirms his innate greatness and grander purpose. MI6, the British intelligence agency that Bond serves, is under attack. Bond’s longtime boss and sometimes friend, M (Judi Dench), is the actual target of this aggression. Her reign over the agency is being questioned because a top secret list of undercover agents the world over has fallen into the wrong hands. As names leak to the public little by little, confidence in her ability to manage dissipates at the same rate and her methods are called antiquated and quaint. The question as to whether MI6, and subsequently Bond himself, are still relevant is plainly posed and SKYFALL affirmatively reminds everyone that they are far from finished. Mendes infuses the Bond series with a level of pedigree it rarely sees. Enlisting John Logan to assist Bond screenwriter regulars, Neil Purvis and Robert Wade, raises the personal stakes for the major characters, as all of them have done things that they aren’t necessarily proud of. Bringing on Roger Deakins, arguably the greatest cinematographer working in film today, invigorates the visual look of the film in so many unexpected ways. His work in Shanghai is particularly creative, which not only makes the fight scenes explode off the screen, but also makes the film a serious visual awards contender. And finally, casting actors as talented as Ralph Fiennes (M’s new boss), Ben Wishaw (a welcome return and updated version of classic character, Q) and Javier Bardem (doing what Bardem does best, the bad guy), elevates everyone’s acting game to the next level. Despite all of this undeniable ability, both in front of and behind the camera, it is Mendes himself who deserves the most applause. His control over this always elaborate, always exciting and always engaging experience is infallible. He can take the film from quiet and tense one moment to loud and intense the next without missing a beat. 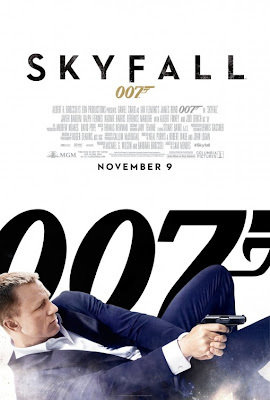 SKYFALL is something of a cathartic experience almost. Bond is reborn and while his past transgressions inform the man he has become, they do not dictate the man he is going to be going forward. And after people see the newly reincarnated James Bond, they will no doubt be ready to follow him wherever he goes next. How many sheep would you give Skyfall?